my Name is Robert from Germay and i'm a new User of this Forum. I have trouble with my Enterprise 128. Only the 64KB (Video-RAM) is working. The internal 64KB expansion is not working. When i start the EP, the Memory-Test shows FF-FC and then comes the ENTERPRISE Picture. In Basic shows 65535 Bytes. 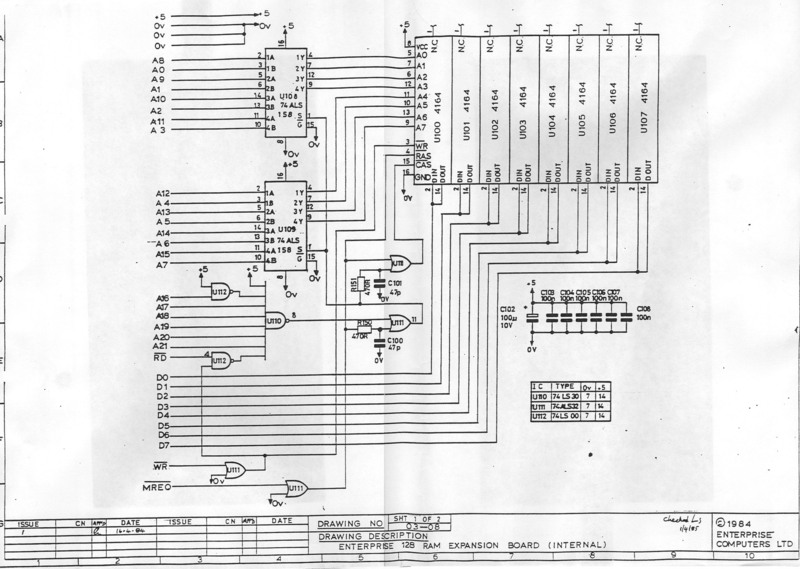 In the Schematic is a 74ALS158 and in my EP is a 74F157 -> it's a little bit Mystic for me. Can anybody help me to resolve this issue? Is there a easy way to find out the damages components? My advice: throw out the old 64K expansion and order new 512K or 1M expansion from Saint! The original EXOS RAM test will test the first byte of the RAM segment, if this byte failed then the RAM not detected. If the first byte good the start testing, and if failed marked as bad. And you will see xxxxx bytes not working. If one or more RAM IC totaly dead then the RAM expansion will be invisible for the original EXOS. I wrote new RAM test routine for updated EXOS (2.2+, 2.4 beta 5 the most recent), it is will detect the faulty expansion if least one bit (=least one RAM IC) working. For the first step need to run my test on your cumputer. Upgrade the onboard ROM (most recommended, because other EXOS bugs fixed), or also availeble cartridge version of the RAM test, or there is a loadable version (it is start with the Advanced RAM test mode). If the missing 64K detected as faulty memory, then the problem will be one or more faulty RAM ICs. If this test also not detect it then the problem with the address decoding circuit. If the problem with the RAM ICs then try to write/read bytes of the faulty segments, and identify which bits not working. It is possible from BASIC with SPOKE/SPEEK instructions, but more comfortable from a Monitor program, for example from ASMON. I suggest check the wires and solders of the expansion connection for a contact problems. 74xxx158 and 74xxx157 are compatible in this situation. The 158 have a inverted outputs, so when accessing 0000h of the 64K expansion, the FFFFh accessed with 158 ICs, and 0000h with 157 ICs. But at this situation don't care. Both type used in Enterprise machines, in a different production batch. many thanks for the fast responce and the help. I have the EP testet with your tool "MT.COM" and the Result was "BAD 64KB". the "A" Key for Advanced test -> Coputer makes a reboot and shows the Picture. In my opinion one or more RAM's defective, or? You wrote, it's possible to find out the defective RAM? Do you have a EXDOS card? I guess from the number of unused bytes, it is looks a German configuration with EXDOS 1.0 ROM. From disk you can easy load ASMON, then start it with :ASMON command. Then page in one of the faulty segments, press O, port B1, value F8. If you see anything than 00 00 00... then see the problem. If 01 instead 00 then bit 0 RAM IC are the defective, at 02 the bit 1 and etc. If the 00 bytes are ok, then repeat the fill step now with FF and check again the contains. If FE instead FF the bit 0 defective, at FD the bit 1, etc. Yes you are right. I have a EXDOS Card with EXDOS 1.0 and German settings. It was easy to load and starting ASMON. I have made the steps as you wrote and ASMON shows from 4000-7FFF all Bytes with 40. Then the RAM IC which are store the bit 6 are the defective, always outputting 1. From the schematic this is the U106. many, many Thanks for your Help and Support. I have replayced the RAM-IC U106 and the EP works now perfectly! Please can you send me the best or newest EXOS and also the EXDOS ROM Binary-File. I'd like update my Enterprise with this ROM's. There is the latest EXOS. For use need a 64K EPROM (27C512), and add A15 address line to pin 1. Yes i have a original EXDOS Card and i see the "Jumper". There are three solerding Holes named with A14 and +5V and the middle without Name. There is the German/English version. It is only the EXDOS, shortly I add the German/English ISDOS to the ROM.